TX3X operated from the Anchorage Inlets, the above-water area named Les Trois Ilots du Mouillage ("the three anchorage islands"), which are less than two meters above sea level at high tide. The surface is composed of crushed coral and pumice stone to a depth of over 36 inches (~1 meter) on a coral base. The reef is home to thousands of nesting seabirds with an active population of hermit crabs and sea turtles. 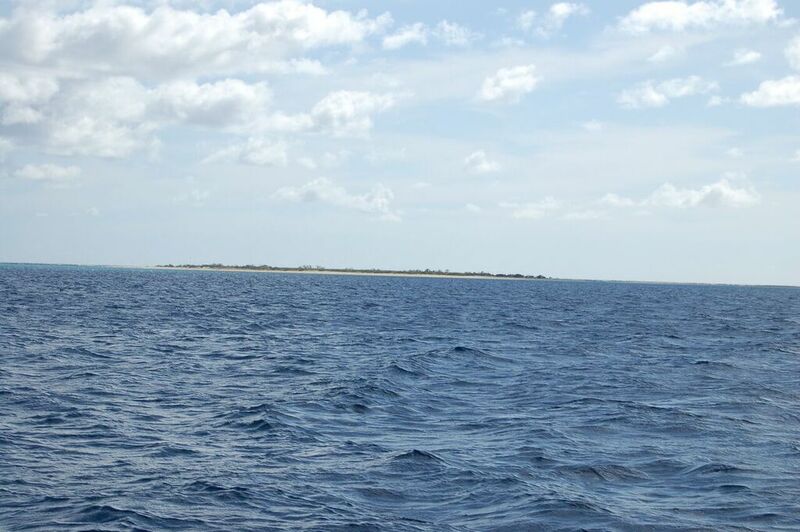 Surrounding the island are submerged coral heads which make navigation hazardous. As seen during previous DX-peditions to the Coral Sea, the beauty of the white sand against the blue water and submerged coral is stunning. The sun reflecting off the water and coral produces the most beautiful colors in the spectrum. The submerged coral heads required our boat to anchor about 500 meters offshore. We used a Zodiac to travel to and from the island, carefully navigating around the submerged obstacles. The idea to activate Chesterfield surfaced after the VK9MT project. Pista HA5AO, Les W2LK, Gene K5GS met at Friedrichshafen (Germany) to discuss several alternatives. At the time Chesterfield was #24 on Clublog but we knew it would move up the list after the Navassa DX-pedition. We contacted Remi FK8CP and Sam FK8DD and asked for their assistance with landing formalities and radio licensing. We also contacted the ARRL to verify their requirements for landing permits / permission documentation. 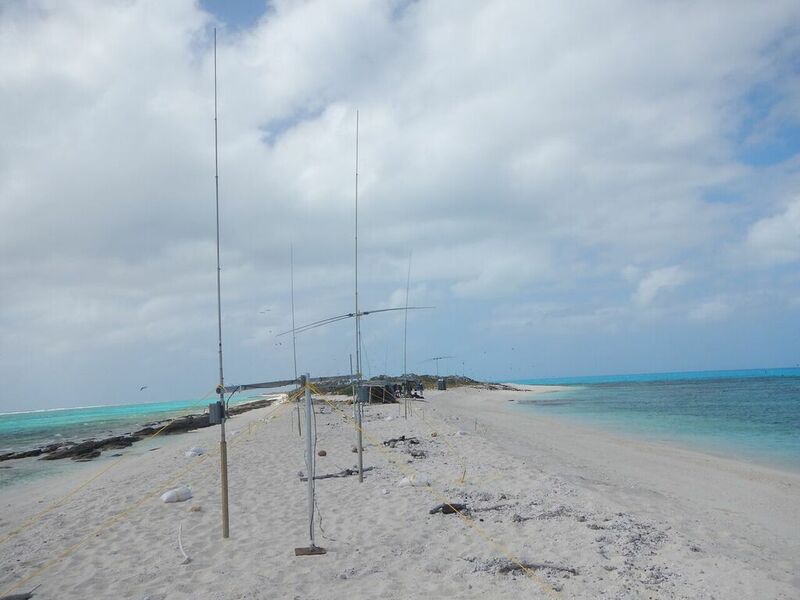 Remi FK8CP contacted the radio licensing agency in Noumea and helped with the process to get TX3X. Each operator submitted a copy of their amateur radio license and passport. 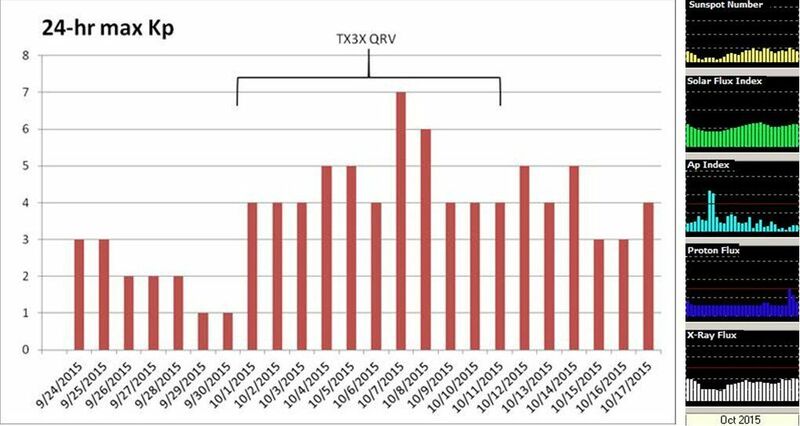 The TX3X license was valid from 30 Sept to 14 Oct, 2015. We formed the team of: Pista HA5AO, Les W2LK, Gene K5GS, Arnie N6HC, Tom ND2T, Ross K6GFJ, David N6HD, Steve W1SRD, Mike WA6O, Walt N6XG, Kevin K6TD, and Alan AD6E. Figure 2 L-R Ross K6GFJ, Walt N6XG, David N6HD, Gene K5GS, Les W2LK,Kevin K6TD, Tom ND2T, Steve W1SRD, Pista HA5AO, Arnie N6HC, Alan AD6E, Mike WA6OMany of the team members knew one another and others met for the first time at the International DX Convention in Visalia, California in April 2015. Over the course of the project team members worked well together and helped one another as needed. Their prior DX-pedition experience and creativity was evident. 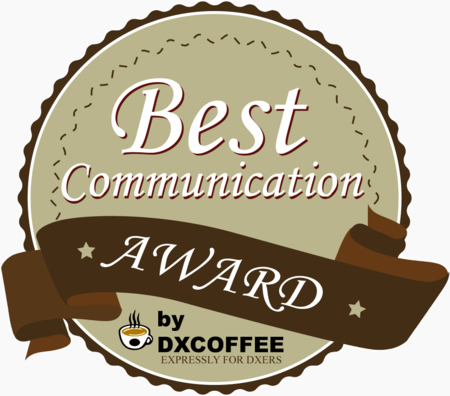 Since all but one of the team had DX-pedition experience, the decisions came easily. At their own expense, team members were required to have emergency evacuation and medical insurance. Each member provided his medical history to team doctor Arnie N6HC summarizing any serious medical conditions, medications used, where the medications were kept, and emergency contact names / telephone numbers. Physical limitations could preclude a person from joining the team. Boarding or leaving the Zodiac, climbing into a bunk or even using the boat’s toilets can be a physically challenging task in rough seas. Each team member had to be self sufficient. Since all of the team members were in the at-risk cardiac age group, we thought it prudent to purchase a portable Automatic Electronic Defibrillator (AED) to add to the medical supply kit. 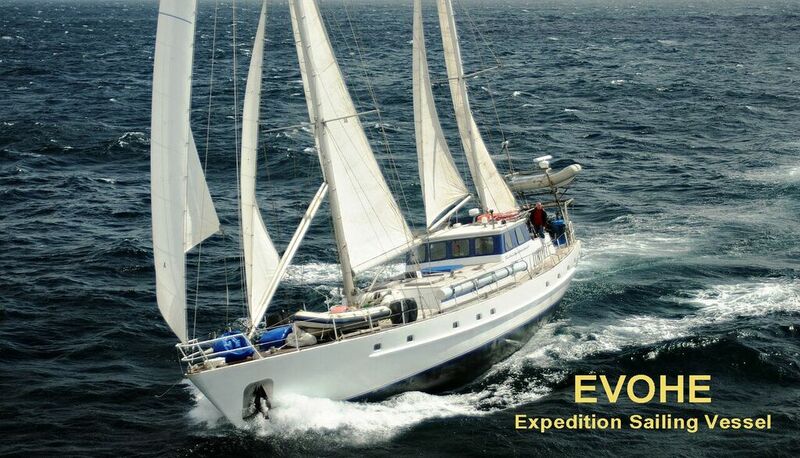 Figure 3 - Evohe from Dunedin, New ZealandThe expedition yacht Evohe from Dunedin, New Zealand was previously used for the Campbell Island and Mellish Reef DX-peditions. We contacted owner / skipper Steve Kafka and asked if he would be interested in a new project. Evohe is a six sail sailing ketch with two Ford engines. With a top speed of 10 knots we could reach Chesterfield in 3 days from Noumea, New Caledonia. Evohe is a no frills “working boat” licensed to carry twelve passengers and up to eight crew. A “working boat” means there are few, if any, creature comforts on the boat. The skipper had a crew of four New Zealanders: Ray, Allison, Tori (ZL1TOR), and Jake. Two of the four had DX-pedition experience: Tori - Campbell Island and Allison - Mellish Reef. We selected Noumea, New Caledonia as our departure point to minimize the number of days at sea. Regularly scheduled Skype and Web-Ex conference calls were conducted to plan every aspect of the project. Budgets were established, responsibilities assigned, fund raising began and soon various documents began to take shape. We contacted equipment manufacturers and dealers for support. Elecraft supplied 6 complete stations: K3 transceivers, KPA-500 amplifiers and P3 scopes. DX-Engineering donated thousands of dollars in coax, accessories, masts and power supplies. Expert Linears America, LLC loaned us the new SPE 1.3 kw amp. Tom Schiller N6BTsupplied six vertical antennas while SteppIR and foldingantennas.com sponsored the beam antennas. Other suppliers of critical equipment included Arlan Communications (Radiosport headsets), MicroHam (interface units), GM0OBX (custom interface cables), Innov Antennas (high power filters), Spiderbeam (accessories), Array Solutions (SAL antenna) and Northern California DX Foundation (low power filters). The USA sourced equipment was consolidated in San Jose, California at the home of Ross K6GFJ. Supplies and consumables were sourced in New Zealand, where we would consolidate with the US shipment. Heavy items such as tents, generators, the electrical grid, fuel drums and miscellaneous items were purchased in New Zealand and stored at Precision Autowerk, Auckland. Figure 4 Pista watching Jake and Tori loading equipmentShopping lists and store names were provided to the advance team comprised of Pista HA5AO, Ross K6GFJ and Gene K5GS, augmented by local volunteers Roly ZL1BQD, wife Gail ZL1FV and Brett Sommerville (not licensed). We chose Auckland as the consolidation point for several reasons, the most important being economics. We had access to storage facilities, trucks and a loaner car at no cost to the project. Additionally, it was less expensive to ship the equipment to New Zealand. We loaded the boat on the afternoon of 12 Sept and the morning of 13 Sept, 2015. Everything was trucked to the boat which was a 30 minute drive from the storage site. After our gear was loaded, the skipper took on an initial supply of fresh fruits and vegetables, meats and dry stores. By the end of the day 15 Sept they were ready to sail. On 16 Sept Evohe took on diesel fuel and 1,200 liters of 91 octane petrol for our generators. After clearing Customs and Immigration on Thursday 17 Sept she sailed for Noumea with Pista HA5AO on board for the 7 day journey, arriving on 24 Sept. The team began arriving at Noumea on 25 Sept. Most flew via Auckland, New Zealand where several of us met at the airport. Others flew via Australia. Having never been to New Caledonia I didn’t know what to expect. The island is mountainous and one of the largest islands in the South Pacific. The airport is a 45 minute drive from the city center. The predominant language is French, yet most everyone we encountered spoke some English. The city is modern, with many shops and a well engineered road infrastructure. We arrived on a holiday weekend and almost all businesses were closed making it easy to navigate the streets that were virtually deserted. There was a restaurant next to the hotel and another restaurant at the marina. We had an ample supply of beer and food from those establishments. There was also a McDonald’s near the marina. On 28 Sept we set sail for the 3 day passage to Chesterfield Reef. Although the winds were in our favor we used the boat’s engines for the journey. The skipper planned our arrival at Chesterfield for the morning of 1 Oct when the sun would be positioned so he could see and navigate around the submerged coral heads. 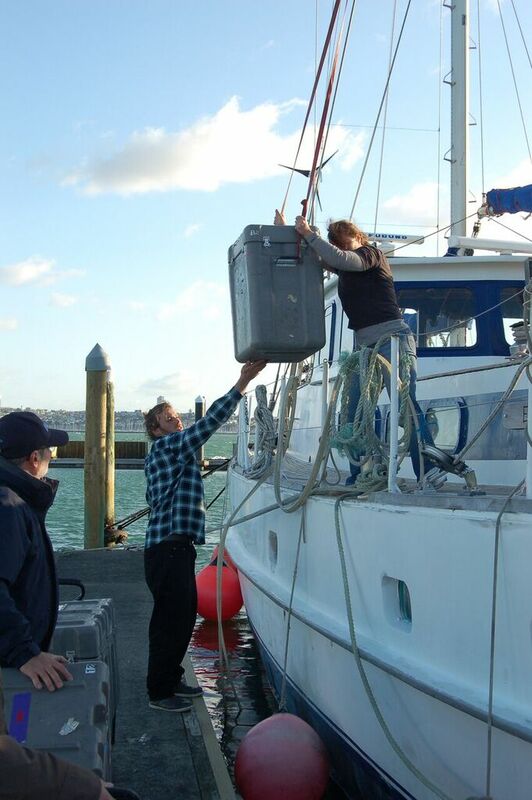 The hard work begins: loading the Zodiac, bringing people and equipment ashore and setting up the camps. The wind was strong and presented a real challenge erecting tents and antennas. It was our constant companion, blowing at a steady twenty knots and regularly gusting upwards of 35 – 40 knots rather than the 15-20 knot trade winds we expected. Figure 5 - First sighting of ChesterfieldThe wind made riding in the Zodiac “an adventure in itself”. Sea spray showered us as the Zodiac plied the rough sea. The skipper asked us to get under a tarp so we wouldn’t get too drenched. The landing area was, for the most part, a narrow sandbar with patches of low growth vegetation consisting of grass and shrubs. Our Mellish Reef experience indicated we needed long tent and guying stakes on Chesterfield. To manage cost and minimize weight we used ninety pieces of rebar each three feet long (1 meter), one hundred twenty wooden three foot landscaping stakes and one hundred sandbags each capable of holding fifty pounds (23kg) of sand. Several techniques were used to secure the tents and antennas, including burying a sandbag in a dead man arrangement and/or augmenting the rebar / wood stakes with a sandbag. Figure 6 Typical sandbag usageWe used five heavy duty tents configured as follows: SSB camp, CW camp, data center / break tent and two sleeping tents. In retrospect we needed more sleeping tents since we couldn’t get back to the boat often enough due to the heavy winds and unsafe sea conditions. 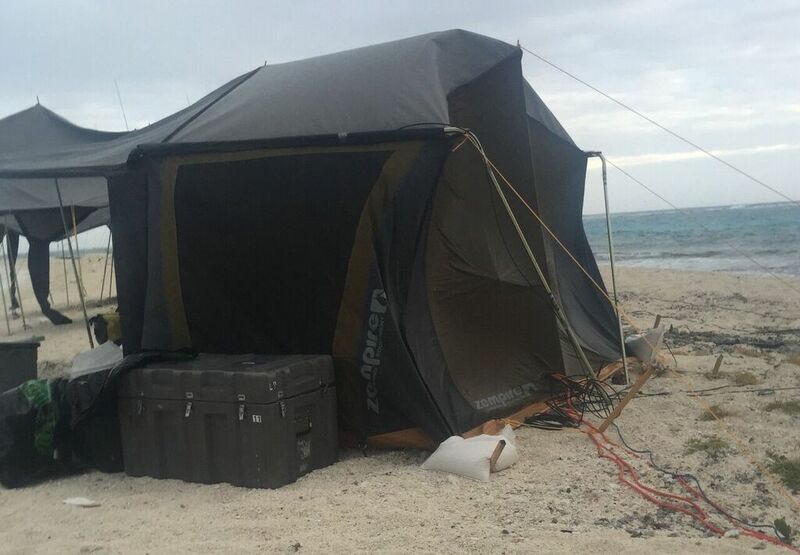 The New Zealand sourced tents were made of heavy duty poly canvas with steel frames. The tents took a significant beating from the wind. They kept the rain out and remained standing. Except for not reading the instructions, the biggest tent challenge was the poles that held up the awning continually sank in the loose sand. The boat crew helped stabilized the poles and performed daily maintenance on the guys. Other than the first night when the wind caused some antenna problems we had no other wind related antenna problems except an inability to erect tall antennas. The area was a narrow sandbar, about thirty feet (ten meters) wide, with the sea on both sides. Salt and sand spray was constant, requiring daily maintenance of the lower antennas. The two element rotatable vertical antennas were installed first, giving us 10 – 40m capability. It was too windy (unsafe) to install the SteppIR beams, the Battle Creek Special or the 80 meter antenna. Figure 7 - Note width of the sandbar at low tideAs the days progressed the wind never subsided and propagation was getting worse. In spite of the dangerous conditions we did get the SteppIR beams erected. On day 5 the 80 meter antenna was raised. Due to the fierce wind, we couldn't get the 18M Spiderpole up for the 80M vertical but we jury rigged a 30 foot antenna mast with a top loading wire in an inverted L configuration. We tried installing the Battle Creek Special, but the winds were too strong. Towards the end of the project the 80M antenna was reconfigured with a longer piece of wire as a makeshift 160 antenna which we used on the last night. After the DX-pedition we saw a comment on the Internet that suggested the antennas may not have been the correct distance from the sea. Maybe the writer knew something we didn’t? Useable space between high tide marks was only about 30 feet (10 meters). Due to the unsafe conditions the skipper severely limited our ability to shuttle back and forth to the boat during the day, and not all at night. We created a shift schedule that kept one team on the reef 6PM to 6AM. Sleeping on the island was very difficult because of the wind and tent noise. The revised schedule allowed sleep time on the boat at night for half the team. Propagation was such that we didn’t see a significant negative impact from this new schedule since the bands were mostly closed. Steve W1SRD made the first contact with AK6ZZ on 1 Oct. Propagation was good with energetic pileups around the globe. We became increasingly concerned when propagation reports predicted strong geomagnetic disturbances. When propagation deteriorated the band openings dwindled. As propagation further diminished, atmospheric noise increased and our rates suffered. Over the Horizon Radar wiped out signals on 40 SSB one night. Figure 8 – October Indices “A”- “K”For the entire operation the “K” Index was “4” or higher, with the “A” Index peaking at 77 on 7 Oct. Propagation was erratic and unpredictable. We experienced pinpoint (cluster-like) propagation where we could hear a relatively small geographic area extremely well. Suddenly signals disappeared from that area and another area would be heard for a short while. There was no doubt you were hearing us better than we heard you. We received reports that aurora was causing problems in northwestern EU. It was disappointing that we couldn’t get on 160 until the last night. The pilots reported your complaints that we worked Asia at the expense of other regions. Unfortunately, we were not hearing the other geographic areas but had almost full time propagation to Asia. We listened often for NA – SA – EU - AF and OC and directed the pile-up when we could hear them. Being so close to JA and hearing them almost all the time was challenging. We asked JA to standby many times but it wasn’t always effective. We tried several different techniques to reduce the continuous calling - some worked and some didn’t. We used seven Lenovo laptops configured with N1MM+ in a networked environment. Contrary to the usual Internet rumors, we uploaded the logs on a daily basis except for one day when we were distracted by more pressing needs. No logs or Qs were lost. We uploaded by day not by band as some Internet rumors implied. We had an unexplained logging problem when over 800 QSOs were incorrectly logged as PSK31. The log was corrected from the island. We had a problem with our website on 6 Oct (GMT date). Our web hosting firm (inmotionhosting.com) suspended our account because we were getting too many hits. Several weeks before the DX-pedition we gave them notice of the expected peaks in usage and offered to pay for additional resources, as required. We called them from the island on the satellite phone. Their system administrator made up a nonsense story about our software being the problem. We then called John Miller K6MM and asked him to intervene with inmotionhosting.com. Within an hour the site was back on-line operating normally and meeting the load. There were no software problems. On the morning of Oct. 12th we went QRT and began the teardown process. Ironically, the wind subsided for a while. We spent about 6 hours in tear down mode staging equipment on the beach and ferrying it back to the boat. The journey back to Noumea was into the wind and very rough. The skipper described the seas as “confused”. While the swells were only about 3 – 5 meters the skipper said the seas were coming at us from different directions. The ride was so rough that team medic Arnie N6HC became concerned that several team members were unable to keep down fluids and food. 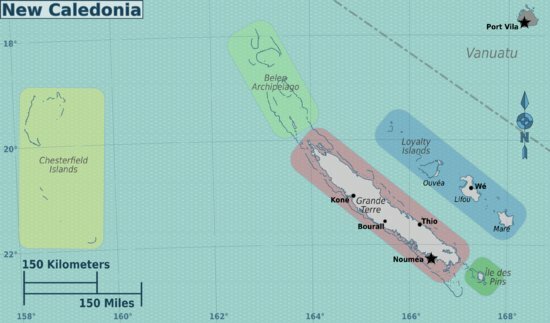 After three days at sea on the evening of 14 Oct. the skipper dropped anchor at Koumac on the far northern tip of New Caledonia. The weather forecast indicated continued strong winds and unsettled seas. The skipper gave us the option of riding the boat back to Noumea or taking a 5 hour bus ride. Arrangements were made by the harbor master to transport the team to a local bus stop a few kilometers away. Arnie N6HC rode the boat while the rest of us took the bus to Noumea. Evohe arrived the next day and Arnie survived the journey. The Evohe departed Noumea on 19 October and arrived back in Auckland on 27 Oct where the Advance Team of Ross K6GFJ, Gene K5GS and volunteer Brett Sommerville, along with the crew, unloaded the boat and trucked the equipment to Precision Autowerk. The weather and propagation presented the greatest challenges causing operating plans to be changed. We had difficulty sleeping on the island due to the sound of the wind blowing across and through the tents. The RadioSport headphones did a good job of minimizing the external noise, but nothing could be done to stop all the tents and operating desks from shaking constantly. Antenna and tent guys required constant attention, primarily due to the sand base and lack of a solid footing. We had salt contamination issues with the lower antennas; the elevated SteppIRs had no problem. On cays like Chesterfield, heat and humidity are important considerations. We brought ashore over four hundred liters of drinking water and twenty pounds (9 kg) of powdered Gatorade to restore electrolytes lost through perspiration. Everyone carried a personal water container. We had a supply of sunscreen and encouraged everyone to protect themselves from the sun with hats, long sleeve shirts and application of sunscreen on exposed areas. The Northern California DX Foundation supplied tropical shirts that were perfect for this protection. We were careful not to disturb ground nesting birds. Many had eggs on the ground and would become agitated if we got too close. Nightly visits by the hermit crabs were always interesting. Other than a few cut fingers, we had no injuries or accidents on the reef. Neither turtles, birds nor eggs were injured although the birds were just as interested in watching us as we were in their well being. The birds were always hovering close to our heads and watched everything we did. Our goal was to work 80,000 QSOs and concentrate on RTTY. Unfortunately, the weather and propagation have a nasty habit of changing the plans. After 10 full operating days, we closed the log with 50,104 QSOs which now shows 50,123 with SWL requests. In general, the DX community cooperated nicely during the pile-ups. However, being so close to JA at times it was a real challenge to get JA to QRX. We appreciated those operators that followed the DX Code of Conduct and wish those that didn’t would recognize the problems they cause for themselves and others. Figure 9 - ResultsThe erratic propagation required you to spend significant time in the chair to work us. We received many e-mails from people who got in the log with 100 watts and a dipole or vertical. We worked a number of mobile stations. I think these operators know their limitations and leveraged their skill to find an opening rather than rely on the cluster. There were two other DX-peditions and a Cuban Special Events station on the air at the same time. We know from e-mails received afterwards that some people who thought they worked TX3X found their call sign in another station’s log. Maybe this was caused by incorrectly posted call signs on the cluster or overlapping pile-ups on the narrow bands? Figure 10 - Pista HA5AO with the bottleHow many times have you walked along a sandy beach, saw a bottle on the sand, and discovered a message in the bottle? 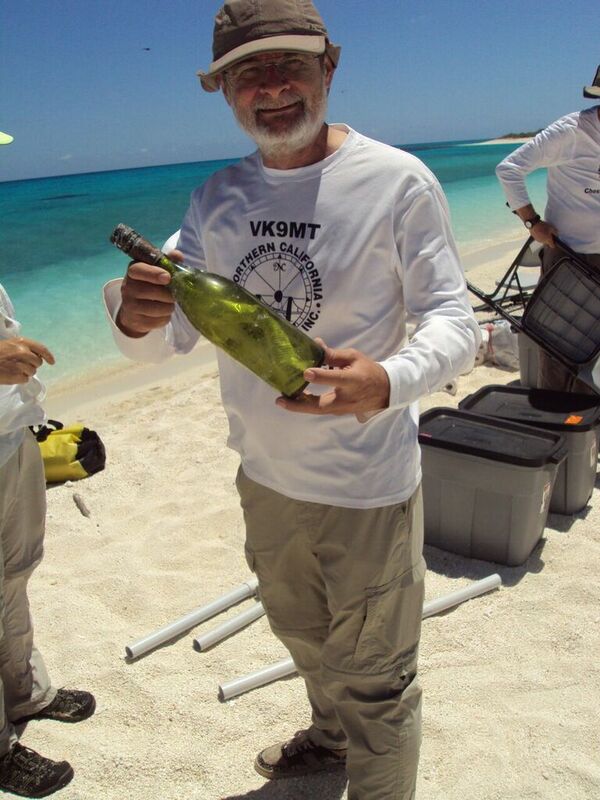 The first team to arrive on the island saw a few wine bottles on the sand. Upon further investigation one of them contained a message. The bottle was dropped in the ocean on March 30, 2014 (18 months before) from the cruise ship “Carnival Spirit” by a family from Australia. The ship was traveling from Noumea to Sydney. We sent an e-mail to the family from the island and later followed up from Noumea with more details and photos. While we were disappointed with the weather and propagation conditions, we realize that there are some things we can’t control. We very much appreciate the support from the global DX foundations, clubs, individuals and partners who helped make this project a reality. Our corporate sponsors were equally important to the project. The global pilot team led by Ralph W4HK, our QSL consultant Tim M0URX and our social media guru Glenn KE4KY did a wonderful job. We met many fine people in New Zealand and New Caledonia who assisted us before and after the project. The highlights of the project included giving ATNOs, putting people on the Honor Roll, Top of the Honor Roll, and supporting the Auckland, New Zealand North Shore Boy / Girl Scouts with our surplus equipment donation. 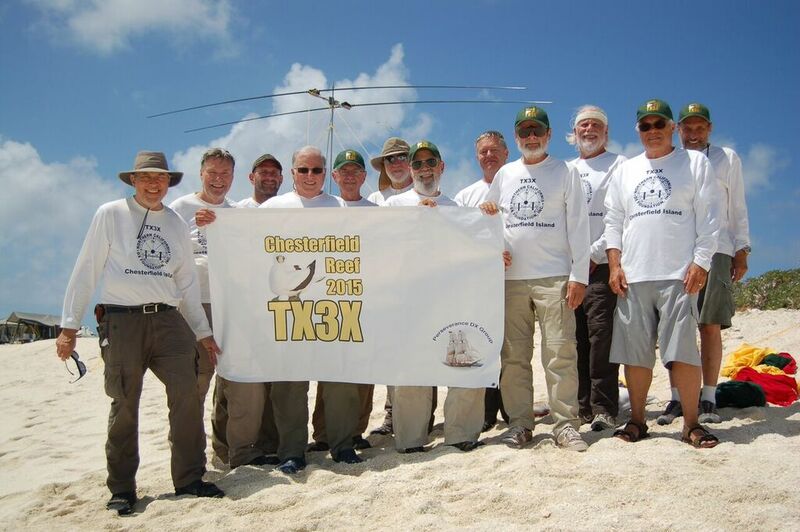 I’d be remiss by not mentioning the camaraderie, cooperation and friendship of the TX3X team, the global pilots and all those who helped us throughout the project.